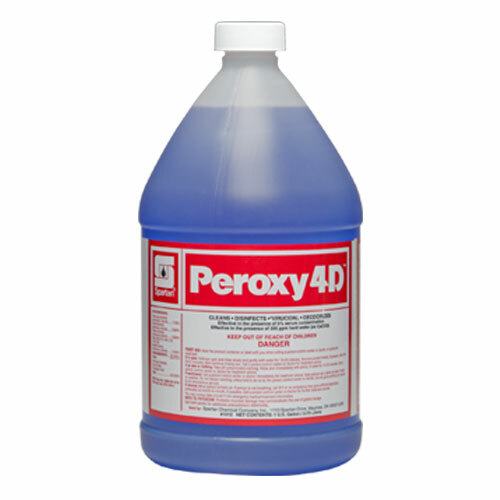 Peroxy 4DTM is a hospital grade disinfectant that delivers fast, effective cleaning performance with the power of peroxide. At 1:64 dilution, Peroxy 4D economically and safely disinfects and deodorizes. Effective against a broad range of bacteria and viruses, Peroxy 4D can be used in restrooms, kitchens, daycare centers, airports, cruise ships, athletic facilities, education and office buildings, gyms, correctional facilities, hospitality and lodging establishments, …anywhere a clean and healthy environment is desired. With a fantastic, fresh scent, Peroxy 4D leaves the room bright and clean, germ-free, and smelling clean!